Please call owner David at 978-852-2598. Boat is in Laconia, New Hampshire. 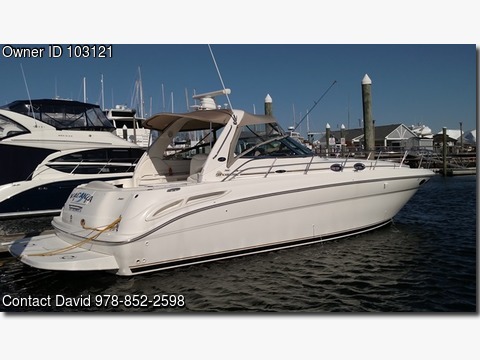 Like new 2003 Sea Ray 380 Sundancer. This boat is in excellent condition inside and out. It features a spacious cockpit layout for entertaining up to 10 adults. Stereo CD Ipod and satellite ready, windlass anchor, bilge pumps, compass, Coast Guard pack, hydraulic steering, It has a full kitchen including a large refrigerator, microwave and stove. It has room to sleep six with the front berth having its own privacy door not a curtain. The large head features a standup shower with a separate shower door.2 showers, H&C water, storage, 2 TV/DVDs, central vac, 5 new batteries, The boat features two 8.1 Mercruiser horizons 370 hp each with just over 500 hours on them. It has a Ray Marine RL 80 GPS chart plotter with radar and autopilot. Westebeke generator, Recent updates include New tinted 40 mil Isinglass, New canvas, New cockpit, carpeting, Newly reupholstered cockpit seats, New Galley refrigerator, New air-conditioning unit, New rises and manifolds, New underwater lights blue,documented, professionally maintained. This boat is truly turnkey. Slip at Spinnaker Cove Yacht Club available for remainder of the year.